The ability of a camera system to record a wide dynamic range and show details throughout the dynamic range is very important to image quality. How well do various system do? On this page, I test a Pro digital SLR camera, professional slide film, and consumer print film as well as raw versus jpeg images from the digital camera. I constructed a test target, Figure 1, below that has a large range of intensities. Spot metering shows the target had a dynamic range of 1500, or 10.6 stops (Figure 2). All images were processed identically. Quantitative results were derived from original unprocessed data except for conversion (raw 12-bit file from the digital camera converted to 16-bit linear tif image; raw 12-bit linear scans from film written to 16-bit tif file). Figure 1. The test target consists of color blocks, gray blocks, and gray ramps in intensity. The charts were printed, and one was placed inside a box painted black to simulate detail in shadows. In the deep shadow in the box above the test chart is a black tube, here called the "black hole" which reflects almost no light. In this view, sunlight is illuminating the target from the upper right. This image is from the Canon 1D Mark II digital camera. Figure 2. Example spot metering values on the test target. The shadows have been enhanced in this image from Figure 1 using the Photoshop shadow tool, applied twice: 100%, then 50%. The exposure times are for f/5.6 at ISO 100, and range from 0.6 seconds in the "black hole" to 1/2500 second on the white paper. The image in Figure 1 was obtained with a Canon 1D Mark II camera in raw mode and converted to a 16-bit tif file using Canon's software with default settings. Two film types were also tested. Images of the target with film and digital were interspersed by using 3 cameras and one tripod. Time between images was less than a minute and repeated several times to ensure any change in lighting was not an issue concerning the results. The film was scanned on a sprintscan 4000 scanner at 4000 dpi using linear 12-bits, outputting a 16-bit tif file using standard settings. The film images were registered to the digital camera images for detailed comparisons. The film was developed at a professional lab, Reed Photo in Denver, using standard developing. 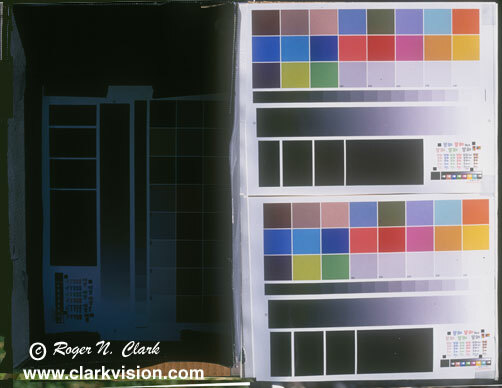 An image of the test target on Kodak Gold 200 print film is shown in Figure 3, and an image on Fujichrome Velvia ISO 50 slide film is shown in Figure 4. It should be immediately obvious that the Fujichrome Velvia image shows higher contrast, and except for a blue color cast on the royal gold film, it has contrast similar to the digital image. The highlights are similarly recorded in all three tests (digital, print film, and slide film), and have intensities in the very bright regions in the digital file within 4% of each other. Some portions of the test images were driven to saturation. To do this, a series of 15 exposures were recorded as a function of exposure time, both above and below the metered exposure and the ones selected had the same brightness at the high end for the same locations on the test target. The exposure times were: Fujichrome velvia: 0.0 stop, 1D Mark II digital: +0.3 stop, and the Kodak Gold 200: +1.0 stop from standard metering. By selecting these exposures, the dynamic range from saturation to the noise floor could be measured for each medium, and the three data sets are registered at the bright end. This is why the curves in Figures 8 and 10 overlay each other at the high end (upper right in each Figure). Figure 3. Image of the test target on Kodak Gold 200 print film. Figure 4. 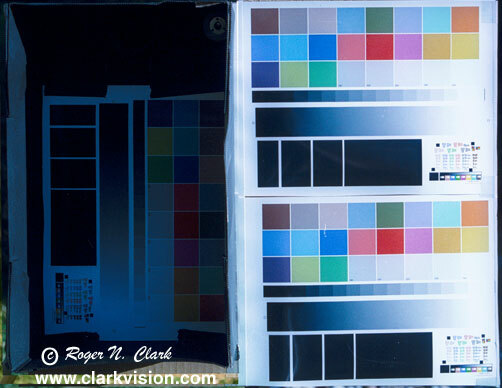 Image of the test target on Fujichrome Velvia, ISO 50. slide film. The shadow detail of the three systems are shown in Figure 5. The images have been stretched with the photoshop shadow tool by increasing the shadow intensity 100% then another pass at 50%. Now we can see that the digital images show much more shadow detail than either print or slide film. Even an 8-bit jpeg digital camera image shows more shadow detail than film. Also of note: the print film shows More shadow detail than slide film. The Fujichrome Velvia shows no hint of the "black hole," while the print film barely shows it. The digital camera images show not only the "black hole" but also more detail inside the box than either print or slide film. Finally, the digital camera jpeg image has slightly more noise than the raw image, but both show detail around the "black hole" better than film. Note too, the jpeg image has a slight greenish cast in the shadows. This can be corrected to some degree with processing, as can the blueish cast of the Kodak Gold 200. All this points to the digital camera having a larger dynamic range than either print or slide film. This is not the commonly cited wisdom. Now we will examine quantitative data. Figure 5. Comparison of shadow detail. The digital camera images show more detail than either print or slide film. This is because of the lower noise and larger dynamic range of digital camera images. All images were processed identically. The shadows have been enhanced in this image using the Photoshop shadow tool, applied twice: 100%, then 50%. The shadow detail in the film was confirmed visually by inspecting the film under magnification: the scans show what can be detected by visual inspection plus a little more. In order to quantitatively examine the dynamic range, transfer function, and noise as a function of scene intensity, an image of the target was converted to a 16-bit tif file with a linear conversion using the canon 1D Mark II data. The sensor is inherently linear, and spot metering agrees with linear numbers derived from the 16-bit tif file over the entire dynamic range. Traverses along intensity gradients were done using ImagesPlus. For this work, 3 traverses were designed to cover the entire dynamic range. Agreement in the overlap regions is good. Figure 6 shows the transfer function of observed output intensity as a function of scene intensity for the Canon 1D Mark II camera in raw mode, with standard conversion using the Canon conversion software. All intensities in this document are 16-bit values from the tif files. Digital camera values are from 0 to 4095, so to get camera values, divide by 16. A mix of linear and log scales will be used to illustrate different points. Figure 6. The Canon 1D Mark II standard processing of a raw file produces these output intensities. Note for dark parts of the image, the scene intensity is multiplied by 10. At low scene intensities (e.g. near 100), spacing in the points every 16 DN is apparent because the original 0-4095 integers are multiplied by 16 to scale to the 16-bit tif file data range. Next, let's compare jpeg versus raw output. This comparison is shown in Figure 7 on a log-log scale. Here we see posterization of the 8-bit jpeg signal at low intensities. The larger scatter in the jpeg data explains the slightly degraded shadow detail seen in Figure 5. The horizontal banding of the red jpeg points is due spacing in multiples of 256 because the 8-bit jpeg data were multiplied by 256 for comparison with the 16-bit data. Figure 7. Jpeg and raw Canon 1D Mark II digital camera transfer functions. Note how the jpeg shows increased noise over the raw data. 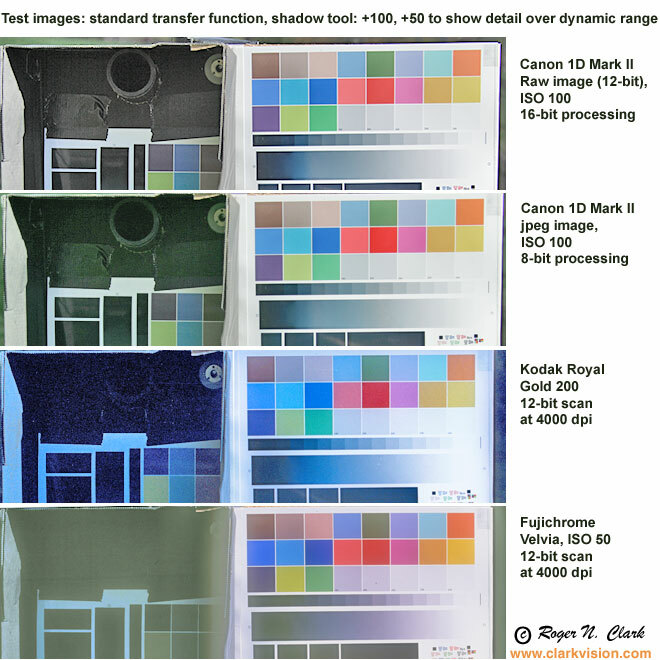 Figure 8a, 8b, below, show the transfer function of a digital camera (a Canon 1D Mark II) compared to print film (Kodak Gold 200), slide film (Fujichrome Velvia), and the relative response of the Human eye (note the human eye has a much greater dynamic range). What this graph shows is that the digital camera response function is similar to print film, but slightly lower in contrast in some parts of the curve, slightly higher in other parts. Fujichrome Velvia has the highest contrast of the 4 systems shown. But also of interest is the noise. Note that the digital camera points follow a nice smooth line. The Fujichrome Velvia points follow a trend with scatter of individual points several times larger than the digital camera until the signal is lost in noise (below about scene intensity = 500 DN). The print film shows the widest scatter and therefore has the highest noise. Also of interest is where each curve flattens out in the lower left corner. Note the Fujichrome Velvia slide film begins to flatten at about 3000 DN on the Scene Intensity, and really flattens out just above 1000 DN. The print film flattens out (and also becomes excessively noisy) below about 900 DN. But the digital camera keeps going to the bottom end of the data below 70 DN. Noise in the digital camera image over the "black hole" was measured at 19 DN (note: that is 1.2 camera DN, limited by the A to D conversion). The Kodak gold average signal keeps decreasing toward lower signal, but the signal becomes lost in excessive noise. 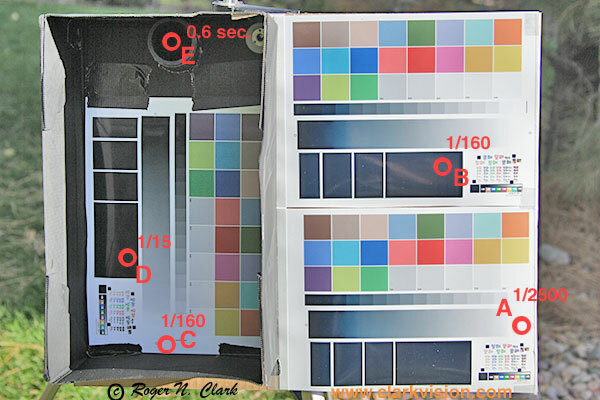 This shows that the Canon 1D Mark II has a much higher dynamic range than either Fujichrome Velvia slide film and Kodak Gold 200 print film. Kodak Gold 200, in this test, showed 7 stops of information, Fujichrome Velvia 5 stops, and the Canon 1D Mark II, over 10 stops of information! Further image analysis shows at least 10.6 stops are recorded by the canon 1D Mark II camera (the full range of of detail in this image, Other testing of the noise level versus intensity shows the Canon 1D Mark II has 11.7 stops of dynamic range. Figure 8a. Comparison of the Canon 1D Mark II digital camera response compared to print film, slide film, and the human eye. Figure 8b. 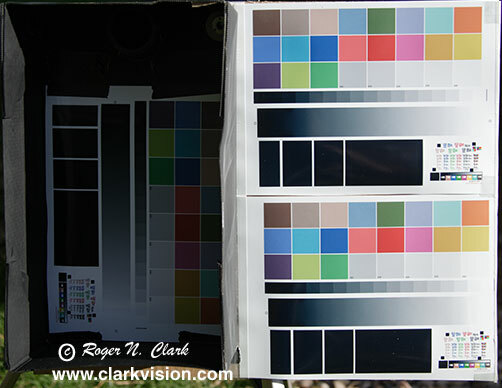 Comparison of the Canon 1D Mark II digital camera response compared to print film, slide film in photographic stops. Recall Figure 7 which showed a difference in noise between raw and jpeg images. In Figure 9a, 9b, 9c, we zoom in on the data in Figure 7 to show the details. In Figure 9a is shown detail for the brightest portions of the scene. It is not necessarily important that the two curves do not overlap. More important is the posterization of the jpeg data. This is observed as the red points fall along short horizontal lines. Their interval is 256 because of the scaling from 8 to 16-bit. The raw data (blue points) show a more continuous curve and therefore more detail in the highlights in the image. Figure 9a. Jpeg versus raw transfer function and noise detail. Figure 9b and 9c show the details of the jpeg versus raw data for mid-tones in the image. While posterization is present, it is small in comparison to the large range of intensities. Figure 9b. Jpeg versus raw transfer function and noise detail. Figure 9c. Jpeg versus raw transfer function and noise detail. Figure 9d shows the intensity comparison between jpeg and raw data for the darkest parts of an image. Posterization is apparent but is masked somewhat by increased noise in the jpeg data. Figure 9d. Jpeg versus raw transfer function and noise detail. How do the transfer curves presented here compare to film Characteristic Curves? Figure 10 compares Kodak's published data on the Characteristic Curve of Kodak Gold 200 which the data for the same film derived in this study. Within the scatter of the points in this study, the two curves agree, and similar basic trends are observed. The film data for this study was at a constant high resolution, so film grain dominates the signal at low intensities. While the characteristic curve data shows a signal could be seen over larger dynamic range going into the dark portions of a scene, that signal would have to be of a large target so many film grains were averaged. Small detail would be lost in the noise. The digital sensor, however, has much lower noise in the dark portions of the scene, by factors of 10 and more! Figure 10. Comparison on Kodak Gold's Characteristic Curve with data measured for this study. Note how the bottom of the characteristic curve is dominated by noise (brown points) at high resolution of a 4000 pixel-per-inch scan. The Characteristic curve from Kodak (red line) is an average response. Digital cameras, like the Canon 1D Mark II, show a huge dynamic range compared to either print or slide film, at least for the films compared. Jpeg digital camera images suffer from posterization and the problem is significant for highlights and darkest portions of an image. Digital camera transfer functions, like that in the Canon 1D Mark II camera, are similar to print film. While digital cameras like that tested here show superior intensity detail and signal to noise, slow speed films have higher spatial resolution. See: Film Versus Digital Executive Summary. Also, see the article Dynamic Range of an Image which shows that real scenes can have over 10 photographic stops of dynamic range (a factor of over 1000). Then explore the article on The Signal-to-Noise of Digital Camera images and Comparison to Film. DN is "Data Number." That is the number in the file for each pixel. I'm quoting the luminance level (although red, green and blue are almost the same in the cases I cited). Photoshop uses signed integers, but the 16-bit tiff is unsigned integer (correctly read by ImagesPlus). Dynamic range is defined as maximum intensity / minimum intensity, where intensity is scene radiance. For a sensor, like in a digital camera, the minimum is usually limited by noise. Thus the dynamic range that can be recorded by a sensor can be smaller than actual scene dynamic range. Posterization is the integer quantization of digital data. For example, 16-bit data has 65535 levels while 8-bit data has only 256 levels. In the conversion from 16-bit (or 12-bit camera) data to 8-bit, some information is lost.